For Sale – Austin A40 Farina Countryman (1965) | Classic Cars HQ. Alert Me! when Austin cars are listed. Selling my 1965 A40 as I don't get to use it enough! I bought the A40 back in 2013 as a second classic alongside my Rover P4 - I owned an A40 back when they were nearly new and wanted to get back behind the wheel of one. When I bought the car it had several issues - not to mention the go faster stripes that the car had been 'treated' to - it was also suffering from a leaky radiator and a very tired interior. Over the last 3 and a half years I've had the stripes removed and the paint corrected and also replaced the radiator, water pump and exhaust system. Mechanically, the car has had a full service and is now running beautifully. Inside, the tired interior has been completely renewed at a cost of almost £700 with newly upholstered seats, door cards and rear side trim. The carpets have also been replaced. I have a huge file of paperwork with the car, covering all the bills from my ownership and some previous owners, dating back to the mid-1990s. 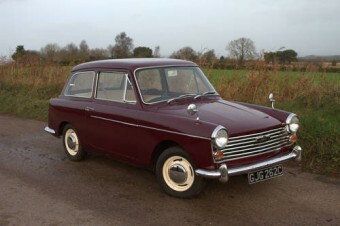 The car was dispatched from Longbridge to Barretts of Canterbury, in Kent on 12th November 1965 finished in Embassy Maroon with a Satin Beige interior (the new interior matches the original). I have been a member of the A40 Farina Club since purchasing the car and I have all of the Club magazines included with the car since June 2013. I am only selling the Austin as I continue to be heavily involved with the Rover P4 Guild and my Rover P4 continues to occupy alot of my time and the A40 isn't getting the time or use it deserves! It does have one or two minor issues that need to be resolved to make it even better than it is - the chromework could benefit from rechroming for the perfectionsists out there and there is some rust under the rear windows (pictured) however mechanically the car is in good order and would make a great usable classic for anyone.